This strong and smiley little muscle man is the perfect mate to take the stress out of your day. If the heap of paper work is too high, the boss is too demanding and the cat won't stop scratching your new couch, grab your little man and bash him on the table. He will remain smiling and you will feel a whole lot better. Our fun stress toy can take a good squeeze and will always return to his original shape. He features a cute comic body with two legs and two huge strong arms held upwards. He has a mop of hair on his head and a big smile to keep you going through the day. 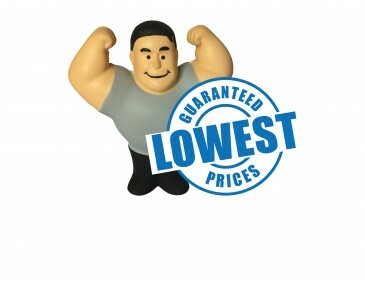 He wears a T-shirt and dark contrasting pants.Add some muscle to your advertising drive when you brand these little men with your company logo and graphics. They are ideal for gym clubs, body building clubs, businesses in the sports sectors or health products and any company that needs some muscle to get their brand noticed. Our listed price includes branding of your logo or graphic in a single colour print. Hand them out at trade shows, expos, outdoor event and sports occasions as fun freebies to your clients and potential clients. They are sure to keep them on their office desks as ornaments and use them when they get stressed out. Please note that our prices exclude GST and a print set up of $75 applies.